Before the treatment begins, our practitioner will check whether you’ve had any sun exposure, they will clean the treated area with antibacterial lotion, and they will provide you with protective eyewear to ensure your safety. The tattoo removal session can last 5 to 45 minutes, depending on the size and the density of the tattoo. Because the pulse duration is short, there is little heat. You have no risk of burns, or scars with PicoSure. The photomechanical effect of the PicoSure laser fractures the ink particles in the tattoo, which are then naturally eliminated by your body over the following weeks. The PicoSure laser does not cause any tattoo removal scars. 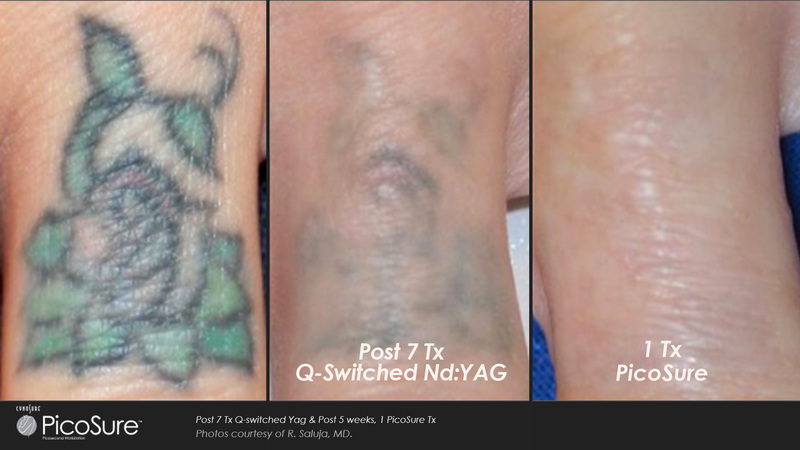 Sometimes, by removing the ink pigment, you can discover pre-existing scarring caused by the initial tattooing process. In the majority of cases with PicoSure, there will be no scar on the tattooed area. What to expect after PicoSure laser treatment? You will notice a significant results after one treatment. After each session, your tattoo will become progressively lighter, until it is removed completely. After the first session, it is normal to notice some localized redness. This is usually accompanied by a feeling of heat. These effects usually disappear after a few hours. A crusts, a scab, edema, or a blister may also occur. Be careful, do not pick scabs or blisters. These symptoms last on average 15 days and a repair cream can be applied to accelerate healing. We rarely observe hypo or hyperpigmentation reactions. If so, these are reversible in most cases. It is important to remember healing times will vary greatly from person to person. It is recommended to leave at least 8 weeks between each PicoSure laser treatment. After tattoo removal, it is essential to clean the treated area daily with clean water at home and to dry it well by tapping lightly with a clean towel. It is advisable to apply an antiseptic cream 2 to 3 times per day until the area has completely healed. In some cases, a surgical dressing may be applied for a few days to accelerate the healing process. Do not scratch or scrub the treated area. Applying a SPF 50 sun protection to the treated area is critical for 4 weeks after treatment. What to do in the case of side effects? A skin reaction may occur following one of your sessions. If you experience this, some blistering is normal. We recommend you moisturize the area with a healing cream and cover it with a dressing or compress to avoid chafing. If, after the treatment, you are worried for any reason we would recommend you come into our clinic for a consultation with our doctor and they will be able to address any concerns you have. The PicoSure laser is effective on all ink colors including blues, reds and greens. The treatment is especially very effective on stubborn colors competitor lasers struggle with. Because this device fractures the ink into very tiny particles, your body identifies them easily as a foreign substance. As the immune system recognises these fragments, it stimulates the natural detoxification process, thereby safely removing the material from your body. The PicoSure laser is the first tattoo removal laser which delivers results without damaging surrounding skin tissue. You can achieve impressive tattoo clearance from just one session. If you’ve tried other tattoo removal lasers and have been disappointed in their performance, you will see a marked improvement with PicoSure. You may also want to consider fading your tattoo if you want it to be covered by a new design. This will only require 2 to 3 sessions. Tattoo removal results vary from person to person as every tattoo is different. The number of sessions you will need depends on the colour and ink density of the tattoo. Your immune response and detoxification capacity also play a role in the process. The PicoSure laser is the gold standard in laser tattoo removal and provides the best results in erasing tattoos. Choosing this method to remove your tattoo guarantees you will receive the fastest and the most effective treatment, saving you both time and money. To find out exactly how Epilium & Skin can help you safely remove your tattoo, select the link in the top right corner of your screen to schedule a free consultation.